RapcoHorizon Stage Series Snake 8 Channel, 4 Return, 150 Ft. 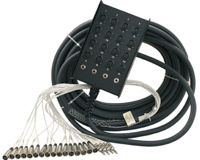 This item is the "Stage Series Snake" S8x4-150, 8 Channel, 4 Return, 150 Ft.
RapcoHorizon's Stage Series features CL-2 snake wire with a low-profile 18 gauge steel box, raised edges to protect the connectors, nylon "D" series connectors, professional quality strain relief. Because the wire meets NEC specs for permanent installations, you can run this snake behind walls, ceilings, and floors without conduit (check your local fire codes) or it's a great snake for a band with a tight budget! Photo shows generic RapcoHorizon Concert Series Snake 16-4-100, with Switchcraft connectors.